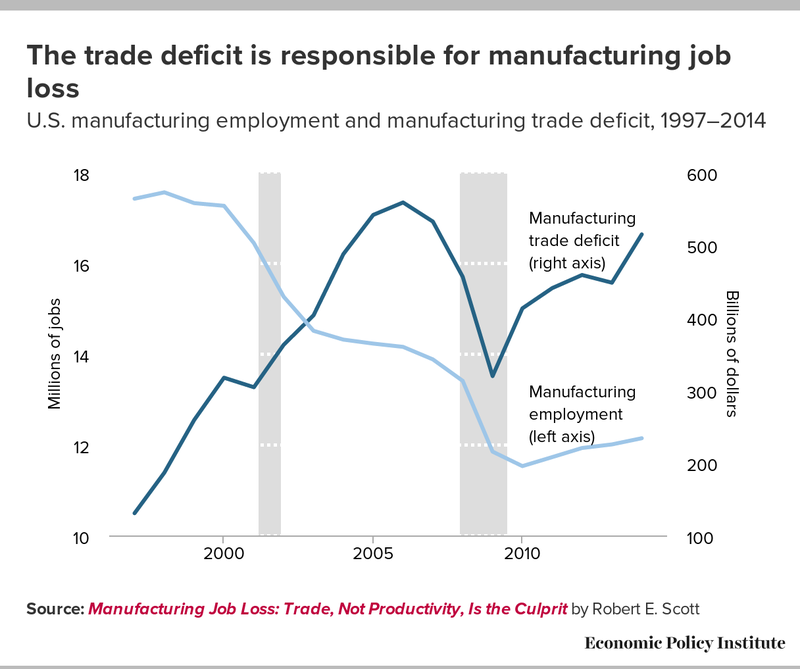 Growing trade deficits and the collapse of manufacturing output following the Great Recession are directly responsible for the loss of 5 million U.S. manufacturing jobs that occurred between 2000 and 2014. As the figure below shows, manufacturing started rapidly declining in 2000, just as the U.S. manufacturing trade deficit began to rise sharply. A rising trade deficit indicates that U.S. manufacturers are losing business to manufacturing industries in other countries like China and Japan, who manipulate their currency to make their goods cheaper and therefore more appealing to consumers in the United States and elsewhere. This leads to reduced demand for goods produced by U.S. manufacturers, both at home and abroad. Between 2000 and 2007, growing trade deficits in manufactured goods led to a loss of 2.6 million manufacturing jobs. When the Great Recession hit and consumers pulled back on their spending, the collapse in demand for U.S. manufactured goods caused a loss of 2.3 million additional manufacturing jobs. While in the past the manufacturing industry has typically regained most if not all jobs lost during a recession, manufacturing employment after the Great Recession has experienced an anemic recovery—only 900,000 of the 2.3 million jobs lost have been recovered since 2009. This is because the manufacturing trade deficit has skyrocketed since 2009 as a result of the rapid growth of imports from China and other currency manipulators. The manufacturing trade deficit grew from $319.5 billion in 2009 to $514.6 billion in 2014—very close to its pre-recession peak of $558.5 billion in 2006.